Nautical motifs are some of the most versatile design elements – they can be dressed up in classic navy and white or become more playful in a whimsical illustrated design. 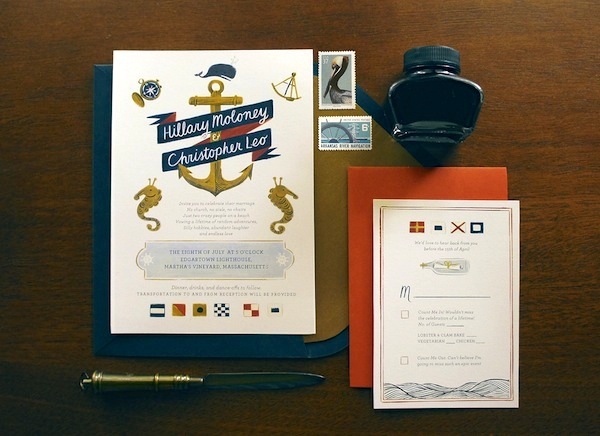 I couldn’t resist sharing these nautical wedding invitations and save the dates spotted over on the Quill & Fox. The illustrations and nautical flags are just too much fun! From Yas: The couple share a love for traveling and having fun — which is a perfect thing to embody for this set. We wanted to make a strong early statement for the save the date, using iconic nautical imagery and an illustrated whale that’s slightly reminiscent of the old style book illustrations. The invitation set includes a large map of Martha’s Vineyard, along with specific information about the wedding venue and other important guest instructions. 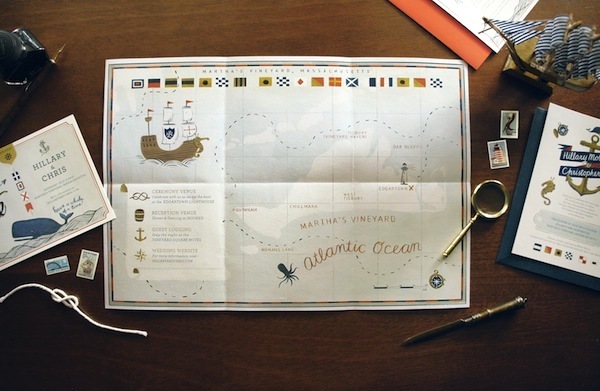 The contents were laid out to mimic a playful interpretation of a captain’s map. Read more over at Quill & Fox right here!